Want to watch YouTube/FLV videos on your iPod or iPhone without WIFI or Internet? Then mediAvatar YouTube to iPod Converter is the ideal solution for you! With this easy-to-use YouTube/FLV to iPod Converter you can download YouTube FLV/HD videos and convert YouTube to iPod MP4 format in just one click. 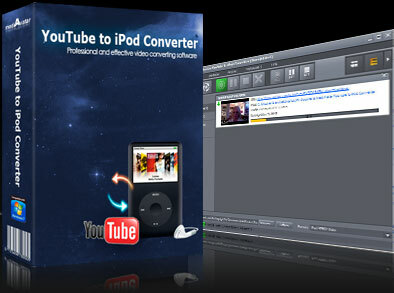 It's also a YouTube to iPhone converter to download and convert YouTube to iPhone videos. Drag and drop YouTube video URLs to the YouTube/FLV to iPod Converter to start downloading and converting easily. Browse, search, play YouTube videos you like in your web browser or the program built-in browser, download and convert your favorite YouTube videos to your iPod, iPod Touch and iPhone! Download mediAvatar YouTube to iPod Converter for free now, watch YouTube videos on your iPod/iPhone on the go even without internet connection! Download YouTube FLV or HD videos and convert YouTube videos to iPod MPEG-4 or MP4 format videos. Download YouTube videos and convert YouTube/FLV to iPod videos in a single step. Download multiple YouTube videos and convert these YouTube/FLV videos to iPod videos simultaneously. Provides flexible ways to download YouTube videos to iPod: with the built-in browser, through your web browser, or by directly dragging & dropping video URL to the program. Browse, search, play and download YouTube videos with the built-in YouTube Video Browser just like you do these on the youtube.com. Install this YouTube to iPod converter on your PC and you can browse YouTube videos in IE and download them directly by right-clicking on their URLs. Specify a proxy server within the application for downloading YouTube videos. Initiate the YouTube to iPod download process by simply dragging & dropping the video URL to the program or the "Drop Zone". Download and convert multiple YouTube videos simultaneously at high speed with batch processing and multithreading applied. Automatically performs the preset action (systems shut down, hibernate, stand by, exit application, or no action) at the end of the YouTube to iPod download and/or conversion process. Interface available in English, German, French, Spanish and Italian. View videos as a list or in thumbnails; view video information; sort tasks by categories. Convert and transfer videos/music to iPod; backup iPod files to computer. Rip/convert DVD to iPod MP4/MPEG-4 video and MP3, M4A audio.